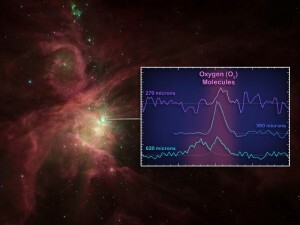 Very cool: the large telescope of the Herschel Space Observatory (formerly called Far Infrared and Sub-millimetre Telescope or FIRST) has detected oxygen molecules in the Orion nebula. The existence of oxygen in space makes sense, since it’s the third most common element in the universe. It’s taken something like 230 years for anyone to detect it, though. The Herschel Space Observatory is one of those projects that demonstrates the benefits of international collaborative efforts. Herschel is a major mission for the European Space Agency, with several nations contributing to the design and build of the instruments and the spacecraft. * However, Herschel is also supported by NASA resources. NASA’s Herschel Project Office is based at JPL, a major contributor for two of the observatory’s three science instruments. JPL itself is a joint project of sorts, since Caltech manages it for NASA. International, multi-national cooperation at its most productive—they found oxygen, after all. *By my reckoning, Austria, Belgium, Denmark, Finland, France, Germany, Ireland, Italy, Norway, Netherlands, Portugal, Spain, Sweden, Switzerland, the United Kingdom, and the United States all contributed during the industrial phase of the project.